Returning to Asian cuisine for the Halibut? 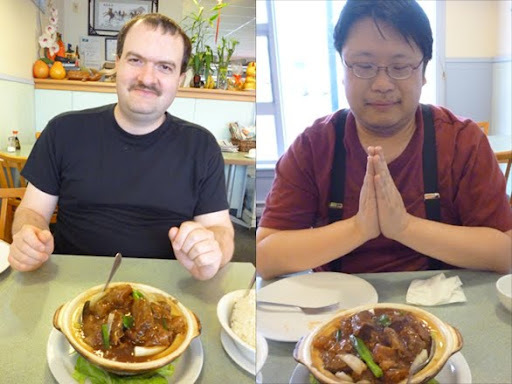 E: After managing to kill an hour in two malls, Uptown and a quaint strip mall off of Quadra and Cloverdale, James and I found a taste of what I fondly remember from Cantonese style cooking cuisine. 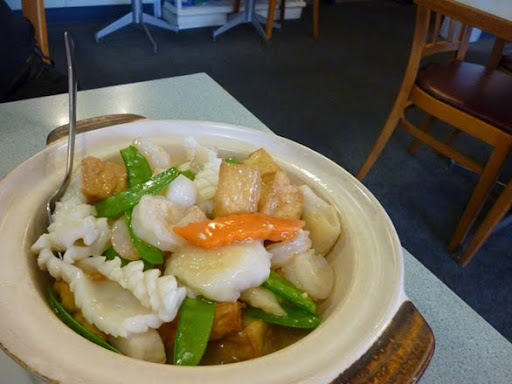 I heard good things about Halibut House from both cultures; the fish n’ chips are said to be killer, and a buddy who’s a chef says not many places can prepare tripe right. While I’ll have to return to try their fish n’ chips, what I found in this visit is a fond memory come to life. I was treated with a smorgasbord of tripe, flank and seafood. We had more than enough to feed a nation of starving students. I’ve never felt so full in my life, and James surprised me by consuming nearly five bowls of rice! J: Having sauce from the flank on rice was a good idea of Ed’s. I just couldn’t help myself. Maybe it was the fat left on the beef as it was simmered that gave it that extra flavour. But one of the other possibilities is that I eat better in a place that makes me comfortable. Halibut House employed a great host. She was personable and made us feel welcome. The small dining room of Halibut House with its Asian décor gave it a mom and pop feel. E: I’m sure this operation is one of those unique Victoria fixtures that have managed to stay around. For as long as I can remember, twenty something plus years, I’ve always driven past this diner and never considered dropping in until now. I’ll certainly be back for more of their won ton dumplings! They make them fresh, and they are made in a way to cause me to reflect back to why I loved them. In the wrappings is a perfect blend of prawn and pork. The dashi broth really brought the flavour out. And a scent of sesame oil accentuated the lightness of the soup. J: She cleared away the won ton broth before I could finish it off. I was very disheartened. But our server replaced what I lost with deep fried won ton. I considered it average and the sweet & sour dipping sauce had too much of an orange taste for my liking. Jade Fountain serves deep fried with more flavour. The main course was something to behold, 3 dishes of delight were set before us. Beef flank (and Brisket), steamed rice and a beautiful seafood hotpot with squid, sole, prawns and scallops mixed with vegetables. I was beginning to realize why this place has existed for so long. E: And that’s because they love their customers (I noticed how well the server knew the regulars by name). Between myself and James, we were nearly bursting at the seams and hardly making it to the last mile with what was presented. I attacked the squid like a hungry shark, and it was delicious. The cephalopod was beautifully soft, squishy and tender. The tripe and flank has a distinct flavour and I’m thinking Hoison sauce was used to enhance the meaty texture. The fat was stewed for a long time with the meat, and it made for a very appetizing meal. I liked how the cabbage gave the meats an additional razzle dazzle. J: But even a razzle dazzle or a pizazz couldn’t prompt Ed to eat more than his fill. And if our meal was a marathon then Ed had limped off to the side of the road. Meanwhile I ran on leaving Ed in my dust. No server is going accuse me of wasting food. I polished off almost everything on the table but I left enough seafood for a doggie bag (why do we call it that). In total we ate our way through over $50 of food (at least $30 of it was mine). I think it’s safe to say I’m almost ready for Beacon and Egg’s food challenge. Bring it on, I dare you! This entry was posted in Food, Reviews and tagged Asian, British Columbia, Cantonese, Vancouver Island, Victoria. Bookmark the permalink.